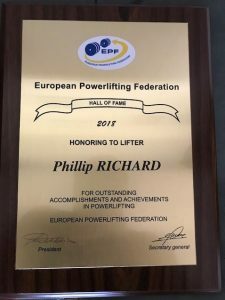 Right for any of you who don’t already know, Last month (May 18) at the EPF European open championships I was elected in to the EPF Hall Of Fame for my lifting. I was totally amazed to have been inducted into this Hall of Fame. Whilst I have been lifting for a number of years both nationally and internationally it was a complete bolt from the blue and a total honour to receive this award. This entry was posted in June 18. Bookmark the permalink.